Diehard Starbucks drinkers are probably familiar with its secret menu, whipped up by dedicated fans and creative Starbucks employees. In Japan, one furtive drink in particular is now out in the open. In Japanese, secret menu is called "ura menu" (裏メニュー), and, like elsewhere, the country's Starbucks have numerous customized drinks that aren't official. Due to regional differences and a secret menu that's not exactly uniform, many of these hidden items cannot be ordered by name. That means you have to order by recipe, which is fine, but rather complex. 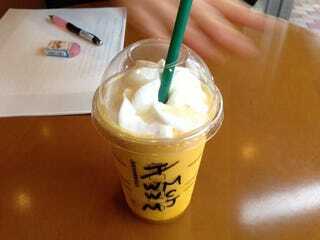 Recently, website GetNews introduced, perhaps, the most famous item on the secret Starbucks menu in Japan: the White Peach Frappuccino (白桃フラペチーノ or "hakutou furapechiino"). This drink isn't made with peach at all, which is part of the appeal. The recipe is rather simple: It's a Mango Passion Fruit Frappuccino mixed with white mocha syrup and optional whipped cream for a delicious drink that, surprisingly, tastes like white peach. However, GetNews reports that Starbucks in Japan are increasingly used to getting orders for the White Peach Frappuccino, and recently, it appears to be possible to order the drink by name. As seen in a GetNews photo below, one Starbucks in Tokyo's Ebisu neighborhood even has a sign out front, recommending the drink for 594 yen! That's not so secret. Peaches and white peaches are very much summer fruit in Japan. So this not-so-secret frappuccino might be an ideal way to deal with Japan's hot and humid weather.